Michael Kazin is a Professor in the Department of History. He is an expert in U.S. politics and social movements, 19th and 20th centuries and is currently working on a history of the American left, to be published by Knopf. 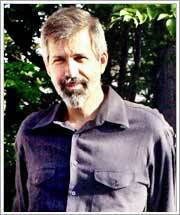 In 1969 Michael Kazin age 22, from Cambridge Massachusetts , was a member of the first Venceremos Brigade to Cuba. Six members of the first Venceremos Brigade, who returned last week from eight weeks of touring and harvesting sugar cane in Cuba, faced the television lights and tattersol pants of the establishment press in a small coffee house near Central Square yesterday. Thursday, 600 feet of film, tapes and journals they had collected for a book to be published by Simon and Schuster and left with a Canadian professor were confiscated by U. S. customs when the professor tried to bring them over the border. Brigade members claim they themselves were harassed, and much of their literature and souvenirs confiscated, when they crossed the border from Canada last week at Calais, Maine. Six hundred more Brigade members left Canada for Cuba last week to help harvest the crop. Their goal, they say, is to help Cuba achieve sugar production of 10 million tons, which will allow the government to purchase harvesting machines and free the people for "more meaningful" work. They may not have found the work meaningful, but they said in their press release, "Many of us felt we were doing truly purposeful work for the first time in our lives ... Accustomed to finding our jobs alienating and destructive, we grew to understand the dedication to work of a people united for their common good." Michael Kazin '70 said the Cuban people love their work so much that city people volunteered their free time and weekends to go out into the fields and harvest the crops. Even Fidel Castro, he said, spends four hours each day cutting cane, and "cuts like hell." "In the American press you read of Cubans working extra hours and they give you the impression they're being forced to do it," Kazin said. "On Sunday in Havana, I saw people joyously laughing and singing and planting coffee trees." While Brigade members wanted to talk about how impressed they were with the Cuban economic, medical, and educational systems, the newsmen and newswomen were more interested in their views on revolution and similar conduct in the United States. Michael Kazin was listed among the "Key Members" of the Students for a Democratic Society on an "organization structure" chart of the "National Council, SDS Headquarters - Chicago, Illinois, Key Members and Regional Headquarters leaders, Exhibit No. 257, in hearings held by the Senate Permanent Investigations Subcommittee in 1969. He was described by a congressional investigator as follows: "Mr. Clay: Michael Kazin: "No. 56 is chairman of the WAV Du Bois Clubs of America in St. Louis, Mo. He helped organize the SDS chapter at Washington University on the St. Louis campus. He has been an SDS National Council member and was Missouri secretary for the SDS Vietnam summer project." "He has been very active with various militant groups in organizing demonstrations against the visiting dignitaries." Maurice Isserman of Democratic Socialists of America , a "respected historian of the left" at Hamilton College, has written Which Side Are You On? : The American Communist Party in the Second World War; If I Had a Hammer, The Death of the Old Left and Birth of the New Left; and The Civil War of the 1960s, with coauthor Michael Kazin. Michael Kazin signed an April 2003 Statement on Cuba, initiated and circulated by prominent Democratic Socialists of America (DSA) member Leo Casey, calling for the lifting of trade sanctions against Cuba. Michael Kazin, of Georgetown University, was an identified member of JournoList - an email group of approximately 400 "progressive" and socialist journalists, academics and "new media" activists. April 6, 2010 at the McShain Lounge in McCarthy Hall Georgetown University, Washington, D.C. a seminar "Labor, the Left, and Progressives in the Obama Era" was held. After the success of health care reform, what’s next on labor’s agenda? How can the labor movement grow and engage with a progressive movement that speaks to the Obama era? What is the role of younger workers, workers of color, and women? Is there a new “New Deal” on the horizon? Georgetown labor historian Joseph McCartin moderated. The event was sponsored by Dissent magazine. We Stand with Alexandria Ocasio-Cortez was a 2018 letter signed by several Democratic Socialists of America members mainly from the DSA North Star in response to attacks on Ocasio-Cortez over remarks she made on Palestine. A recent petition circulated by some DSA members criticizes Ocasio-Cortez for supporting a two state solution to the Palestine-Israel question and not aligning with a long list of demands regarding Palestine and Israel. Should Ocasio-Cortez fail to agree with this list of demands, the petitioners are calling for DSA to revoke her endorsement. These attacks on Ocasio-Cortez have come despite the fact that she has staked out positions which will make her one of the strongest advocates of Palestinian rights and self-determination in Congress. We stand with Alexandria Ocasio-Cortez. The position she has taken on Israel and Palestine are principled stances, worthy of a democratic socialist, in its recognition of both Palestinian humanity and rights and Israeli humanity and rights. On this issue, as many, she will be a voice for the voiceless in Congress. In 2018 Michael Kazin was an original signatory of the DSA North Star founding principles statement. ↑ Riots, Civil and Criminal Disorders, Hearings, Permanent Subcommittee on Investigations, Senate Government Operations Committee, Part 18, June 16 & 17, 1969, pp. 3499-3500 begin_of_the_skype_highlighting 3499-3500 end_of_the_skype_highlighting begin_of_the_skype_highlighting 3499-3500 end_of_the_skype_highlighting begin_of_the_skype_highlighting 3499-3500 end_of_the_skype_highlighting, testimony of Perman H. Clay, "Organizations: Militancy, Extremism and Violence"
This page was last modified on 4 February 2019, at 03:47.